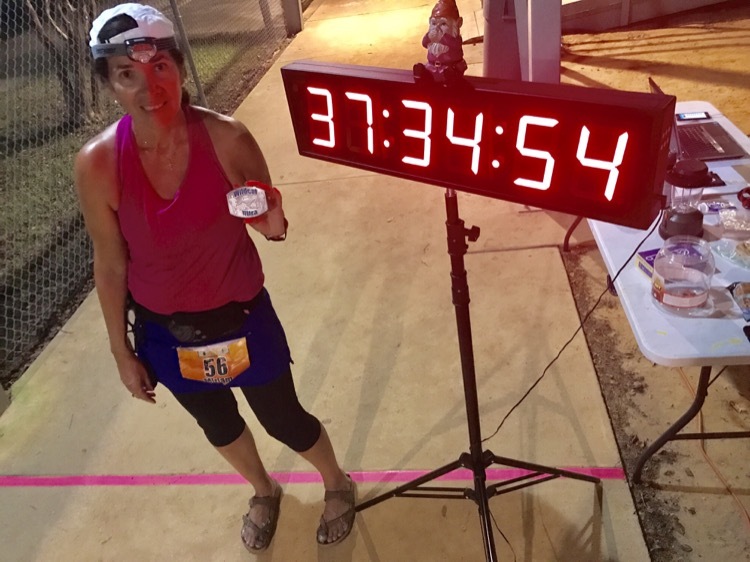 The 2017 Wildcat 100 Ultramarathon in Pensacola, Florida on Labor Day weekend was my first “racecation.” We flew to Miami on Monday, August 28, picked up our rented Cruise America RV, and enjoyed ourselves in Biscayne and Everglades National Parks. It was also a great way to acclimate to the heat and humidity of Florida before the race. This was the 4th annual Wildcat Ultra. Runners ran either the 100-mile, 100k, 50k, or 25k distance. All races had a 40-hour time limit and started at 8 a.m.
Race day morning, September 2, was sunny, hot and humid. 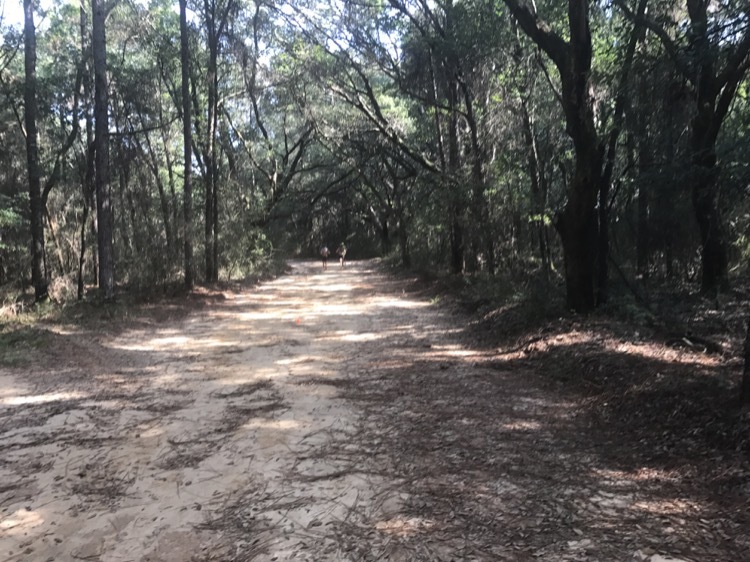 The 2.5-mile loop consists of about a mile of uneven grass terrain with divots, and another mile and a half of a combination of grass with some elevation change and three short, dirt trails with minimal tree roots towards the finish. Two dirt trails were wet and muddy, but the edge of the trails was easily runnable. I was on pace the first 15 miles and then fluctuated between staying on pace and slowing down. I kept hydrated with Nuun and my dark chocolate almond milk concoction. I nibbled on avocado, almond butter, bread, and pickles through out the race. At mile 37.5 I had one meatball, avocado, bread and Pepsi. I also had eggs and bacon at mile 65. The issue I had was my burning toes. This had never happened during an ultra. 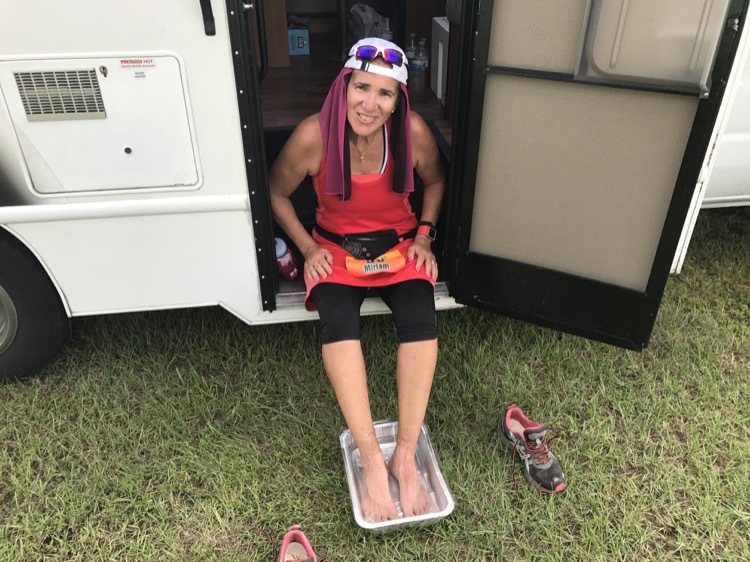 To alleviate the discomfort, I first immersed my feet in an ice bath at miles 22.5, 32.5, 52.5 and 62.5. This took minutes away as every soak took 10–15 minutes. But I felt rejuvenated every time – and the goal was to finish! It’s a good thing I packed my Vibrams and Birkenstocks along with two sets of running shoes – Asics trail shoes and Asics Nimbus Gel. I ran in Vibrams for 30 straight miles between miles 32.5 and 62.5 and ran/walked in Birkenstocks from miles 67.5 to 77.5 and 90 to 100. Both gave me much needed relief. I changed my running clothes Saturday night. Sunday morning I showered in the RV and changed clothes again. My husband took a break at the end of mile 65. I was on my own. By now I was only walking. I had a short crying episode at about mile 80. He began pacing me again. I carried a Birkenstock in each hand. I completed 90 miles in less than 33 hours. My best 100-miler is 27:13:07. I had seven hours to run 10 miles. My husband walked ahead of me and sat on a bench to take a break. I sat on the bench, removed my Asics and socks, put on my Birkenstocks, and bolted like a bat out of hell. I was flying. I ran this lap – mile 92.5 – 18 minutes faster than my previous lap. I ran the next lap pretty fast too. Grateful but exhausted, I shuffled through the last two laps with my husband in total darkness despite my headlamp. My Birkenstocks crossed the finish in 37:32:07. 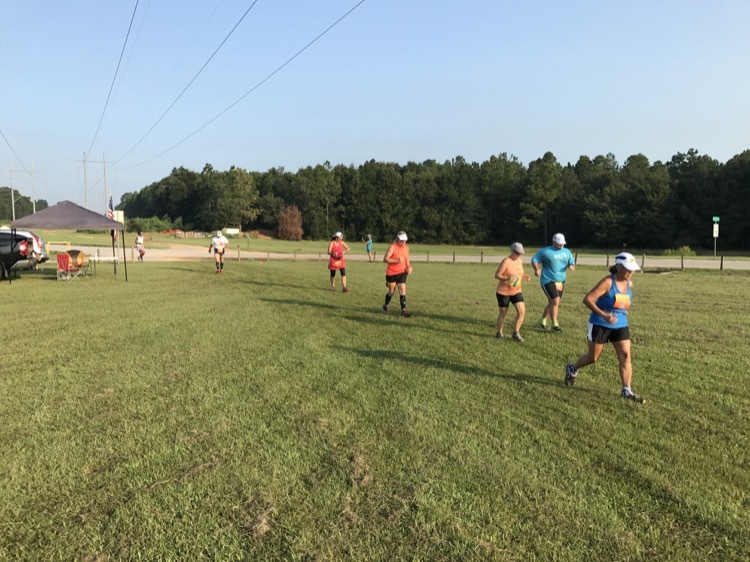 Forty-one runners started the 100-mile distance and 13 finished. I was the 13th finisher and 8th woman. Five men also finished. Micah Morgan was the first female to cross the finish in 19:16:31. Her husband Cary Morgan came in second in 22:44:02. 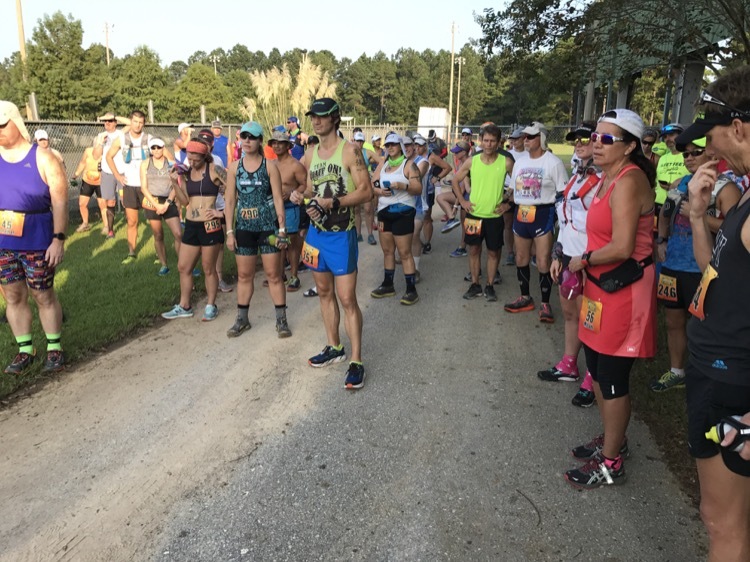 Twenty-eight runners who started the 100-mile distance dropped to the 100k. My burning toes slowed me down but didn’t stop me from crossing the finish line. I have myelopathy of the spinal cord and have been on B12 shots for life since 2009. I may have been low on B12. And I am certain I would not have finished had I not packed my Birkenstocks. The Wildcat 100 Ultra course is runnable but deceptive. 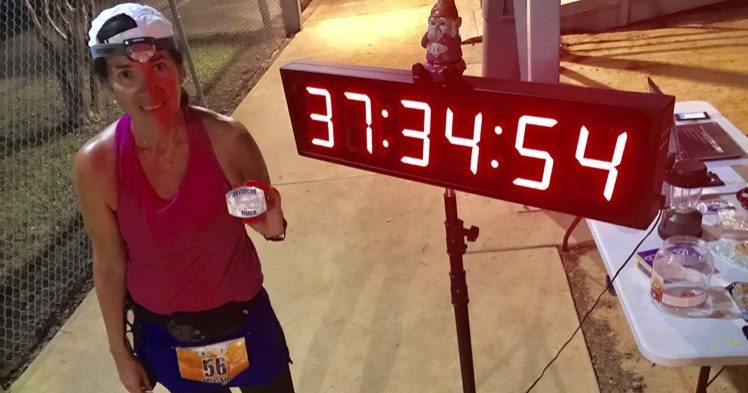 I met a few runners who were running the 100-mile distance as their first ultra. I would not advise this. Even the most seasoned ultrarunner might find it arduous, especially in heat and humidity. There is a reason why there is a 40-hour time limit and why many runners drop down in distance. Kudos to race directors Ben and Aaron, and the race volunteers who were awesome and so supportive! Five years ago on Labor Day weekend, I was in a hospital in serious condition after a major life-threatening surgical error (you can read about it in Women’s Running Magazine). I’m still running, albeit much slower. Finishing is winning! 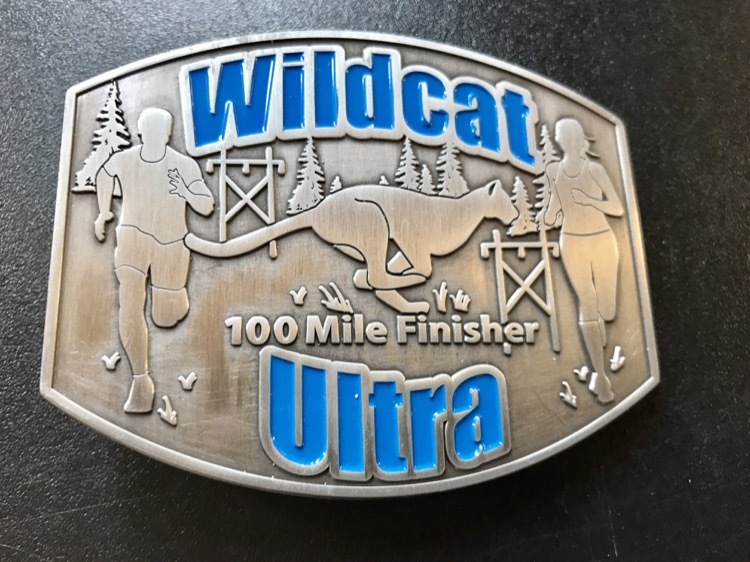 The Wildcat 100 was my fourth 100-miler and 21st ultra.